Adobe’s simplified cloud based photo editing tool ‘Project Nimbus’ accidently dumped for Adobe Creative Cloud subscribers. If you’re not already aware of it, Adobe did showcase a cloud-based photo editor for novice users named as Adobe Nimbus. This was a more humble looking version of Adobe Lightroom, with controls that make it easy for even ‘not-so-tech-savvy’ users to edit photos. Although they announced a beta version release sometime this year, Nimbus accidently leaked and was also downloaded by several Creative Cloud subscribers. WHAT IS DIFFERENT WITH NIMBUS? A major difference between Nimbus and Adobe’s other photo editor tools such as Lightroom and Photoshop is the ease of use. Several features from Lightroom have been streamlined that doesn’t require professional level skills to operate. One can also compare these tools with Apple’s iCloud Photo Library for their sheer simplicity. Moreover since it’s cloud based, users will no longer have to install bulky apps as most resources are stored in the cloud instead of the computer. Simply put, Nimbus contains all the editing tools that a regular user would require without making it too complex. If you wanted to try your hands on Adobe Nimbus before its beta rolls out, unfortunately Adobe have taken down Nimbus for now. Hence users will have to wait a couple more months before it makes appearance on both Mac and Windows platforms. Adobe quickly realised their error and released a statement that said “That morning, we shared Project Nimbus by mistake with a small group of Creative Cloud customers,” before taking it down. Sega’s 16-bit masterpiece makes a historic return. Available for pre-order now! WHAT IS SEGA GENESIS FLASHBACK? We’re glad someone asked this question as they now will be able to know more about one of the greatest gaming consoles of all time. 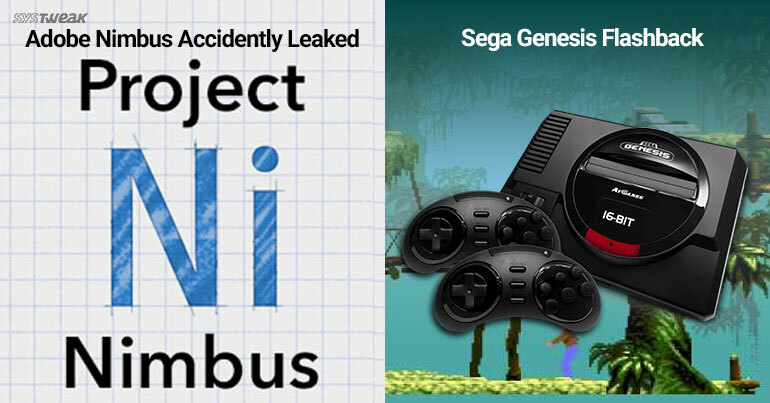 Originally released between 1988 and 89 in Japan and North America, Sega Genesis soon became a household name giving tough competition to Nintendo. Although it eventually lost out to Super Nintendo or SNES, but it still channeled more sales than Super Famicom in Japan way before Playstation was even a thing. Named aptly as ‘Flashback’, Sega Genesis 16-bit console is now making a return and is loaded with a whopping 85 games. WHAT MAKES IT BETTER THAN UPCOMING SNES MINI? While Genesis may have lost out in terms of popularity to SNES in the past, but this current release will certainly prove to be a thorn in Nintendo’s sides. Genesis Flashback is loaded with 85 games compared to SNES Classic Mini’s 21. Moreover, it also has Cartrige support, which might make it a neat addition to any gaming aficionado. Nevertheless, Nintendo have also put NES Classic Mini back in stock before their 16-bit mini makes an appearance. Also, Sega Genesis Flashback while being loaded with 85 games, only 42 of those are classic titles. WHAT GAMES WILL BE PRE-LOADED? Please refer to the below list for all games that will come pre-loaded with Sega Genesis Flashback.